A nice note on which to end the week as Amy Houlston at Burgess tells me that the new CRN motor yacht Lady Trudy has sold, with Nick Dean at Ocean Independence introducing the buyer. 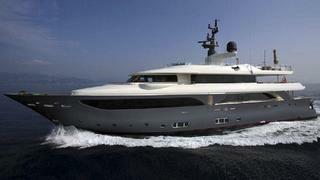 Launched earlier this summer, she is the latest in the Italian yard's popular Navetta 43m range. Built to RINA class and MCA compliant, she features a light, contemporary ‘Hamptons beach house’ interior with five generous staterooms for 10 guests. Other features include zero speed stabilisers and touch and go helicopter capability. Lady Trudy was asking €16.95 million.